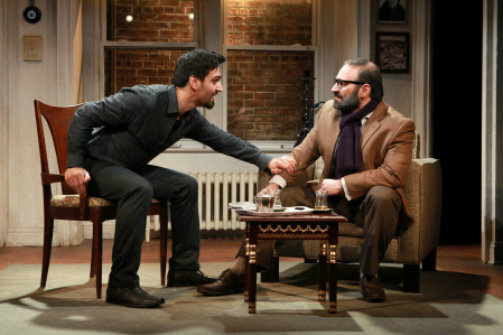 Two-character play about terrorism and violence, both abroad and in the U.S.
Zarif Kabier and Laith Nakli in Shesh Yak. Photo by Sandra Coudert. BOTTOM LINE: Sound staging, a tight script, and good performances round out this timely and provocative portrayal of revenge and remorse in America, influenced by the civil uprising in Syria. These days one can rarely flip on the tube, thumb through a newspaper, or get on the net without reading or hearing about this group or that group terrorizing people in distant lands. Boko Haram continues to sack Nigeria. ISIS continues to sweep through the Middle East. And every now and then Al Qaeda, now considered less deadly than the aforementioned, causes alarm. But rarely do we hear of the brutal tactics of these groups being used here in America. Laith Nakli's compelling Shesh Yak, now playing at the Rattlestick Playwrights Theater, smartly brings terrorism and violence to the stage to remind us that these strategies have far-reaching consequences. Set in 2011 just a few weeks after the Syrian civil uprising has begun, Shesh Yak unfurls in a relaxed sort of way, in a simply furnished, quaint, NY apartment designed by John McDermott. From the very first moments, we learn much about the tenant who lives there based on the decor: his mom is important to him, he values his country, and he lives modestly. To support the viewer's first visual impressions, we meet the tenant, 35-year-old writer Jameel (an unhinged Zarif Kabier), during a phone conversation, already in progress, with his mom back in Damascus. The subject matter may sound familiar: when are you getting married? Is dad taking care of himself? Again, there is the feeling of comfort. We know this character. We understand him. His quick turn-on of the telly also indicates that he's concerned about what's going on back at home. Civilians continue to organize, and lives are in peril. But...he can turn off the TV, like many of us do. We sympathize with Jameel. We understand his fears for his family, but thank God he's not in the thick of things, we think. He got out. Hurray for Jameel...right? The exhales and the phews continue for Jameel even after his house guest, 50-year-old Haytham (an impressive Laith Nakli, bearing a resemblance to Robin Williams), arrives in the wee hours of the morning. Joined by a mutual friend Marwa, Jameel has graciously agreed to let Haytham stay at his place while he's in town on business. Pleasantries are exchanged, and they shoot the breeze about all sorts of things like places to eat, sports, their families, the current civil unrest in Syria, and the way things used to be. They seem to have a lot in common, something that normally establishes ease between two persons. Except, as the conversation continues, Jameel seems to be acting squirlier and squirlier. Something's just not right, and Jameel's nerves seem to jump further than the revealed circumstances would inspire. What could possibly be wrong in what appears to be an almost enjoyable meeting? With an onion-like script that strips away layers of lies, Nakli draws us further and further into a world that deals in offense, defense, and pretense. Jameel, a seemingly normal guy whom we have come to know and like, suddenly has much more depth and pain that we might have initially assigned to him. These two men, differing in stations in life, career, and age, share a much darker past than the audience anticipates. Despite a short running time that seems to fly by, Peter West's beautiful lighting design not only casts Jameel and Haytham in light and dark as a remark on their characters, but it is also a wonderful barometer of time, letting us know that night is turning into day. As the minutes go by, the smiles drop from our faces and we shift in our seats as we realize that the media images that we often skip past, even though most are censored for our benefit, are right before us in this intimate theater. And no, we can't excuse ourselves to the bathroom or to the exit. We must sit through what we normally would not. Shesh Yak's strength is in showing us as well as making us personally feel that there are certain traumas that are inescapable. Although the pacing drags in certain spots and the violence doesn't always ring true, director Bruce McCarty creates a deliciously confusing atmosphere for this duo to befriend us, and then upset us. Together with Nakli and Kabier, McCarty operates a rollercoaster of emotions, and we can't help but be their passengers. There's even a particularly harrowing moment when it appears that a character will meet his end, but then...something much sweeter happens. Shesh Yak is filled with those kind of moments. It's a sometimes warm, sometimes scary, and always entertaining, exciting, educational, and reflective 80 minutes that will make you think twice about the terrorism, still rampant in Syria and other places, that is being experienced overseas...and even here.